We at Adamsdale Concrete have been delivering ready mix concrete for walls, pads, slabs, floors and pools since 1972. Our state of the art computerized batch plants will produce ready mix concrete for any project. We service small to medium size commercial jobs and specialize in residential deliveries. Our trained and experienced employees will always be prepared to pour your job. To insure the quality of our ready mix concrete, we have a state certified testing lab on site. In addition, our company is DOT certified for "Heavy Highway Construction" projects. 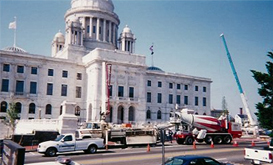 Adamsdale Concrete offers a full line of ready mix concrete and concrete specialty products. Please contact us for any of your commercial or residential projects. Please contact us for your commercial or residential projects. Please review our concrete specialty products. Please use our calculators to estimate your concrete needs.